"It takes a lot of beer to make whiskey." We're not sure who first said it but up until recently we took it to mean that distillers drink a lot of beer. While we'll leave them to say yea or nay, we've also learned that it literally takes a lot of beer, albeit without hops, to distill down into whiskey. So much that House Spirits in SE Portland utilizes 15 tons of malted barley per WEEK. Read on for a look at why they feel their beer brewing roots are integral to the whiskey they make. Founder Christian Krogstad, a Seattle native who attended the Siebel Institute and said his early years were greatly influenced by Redhook, moved to Portland in 1991. Right out of the gate he signed on with McMenamins Edgefield, which had just opened its brewery onsite. He spent quite a few years in the craft brewing world before he made the decision to apply his combination of education and experience brewing beer to distilling spirits, malt whiskey in particular. Those years instilled in him a deep understanding of the innovation that started the craft brewing movement in the Northwest and it was that innovative mindset, not Scottish tradition as one might suspect, that House Spirits is based on. The self-funded enterprise began in 2004 in a modest facility adjacent to Roots Brewing (which closed in 2010) in SE Portland. Roots was the first, followed by many other local breweries, that allowed House Spirits to use their brewing system to make the basis for their whiskey, what is know as a wash. For those unfamiliar with the whiskey making process, a wash is similar to beer but what distinguishes a wash from beer is the time it takes to make it (far shorter) and that no hops are added. As mentioned before, however, they use plenty of grain in the fermentation of the approximately 8% ABV wash, 15,000 gallons of which is produced weekly. Christian's brewing background led to his choice to use all Northwest 2 Row Pale Ale malt as well as his choice of yeast. Instead of a standard distiller's yeast, the House Spirits wash is made with an ale yeast that he feels imparts a better flavor in the final product. In addition to drawing on his brewing background to choose ingredients, he has also assembled a team of distillers that, save one, worked for a brewery before signing on with House Spirits. The brewing knowledge that each member of the team brings with them is part of their lineage, linking them in a very concrete way to their brewing roots. In 2015 House Spirits moved from their original SE facility to a much more roomy facility, intentionally selected to keep them in SE. The facility boasts a 30bbl brewing system and four 100bbl fermenters and is 10x larger than the original space. 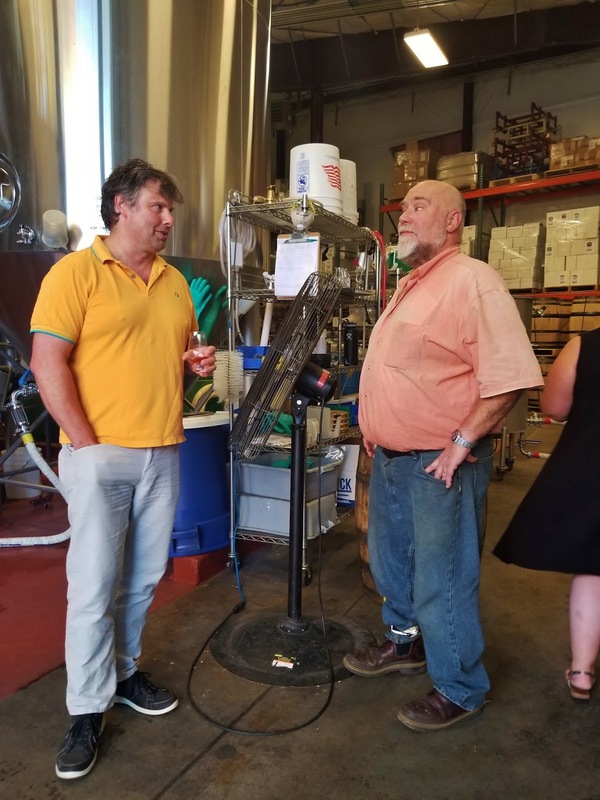 While no longer bursting at the seams and having a greater need to use the brewing set ups at local breweries like when they were making washes at Roots Brewing, Christian continues to partner with local breweries. Alameda, Breakside, Fort George, Migration and Green Dragon have all worked with House Spirits. In fact when Breakside opened their Milwaukie location they wanted to get plenty of practice on their new, larger brewing system. It wasn't beer that was first made however, it was a House Spirits wash.
Another ongoing relationship involves Migration's Frankie Claus, an imperial Belgian chocolate stout. 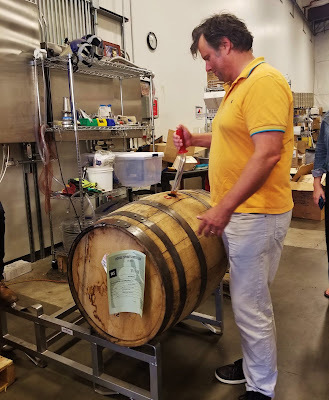 Initially Migration got a whiskey barrel from House spirits and aged a run of Frankie Claus in it. 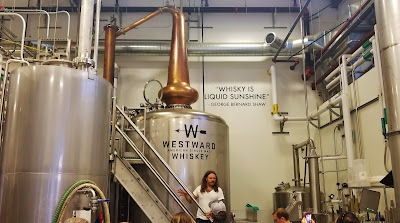 Once the beer was emptied out of the barrel it went back to House Spirits where they decided to fill it with three year old Westward whiskey. After sitting in the barrel for a year the whiskey was pulled out and House Spirits released a stout whiskey. With both parties deeming it successful, this cycle has continued with the same barrel, now on the fifth filling of it. Just as we've found ourselves entranced listening to brewers talk about their history, their beer, their projects for the future, so, too were we entranced listening to Christian talk about House Spirits. If the brief picture we've provided you from our visit has whet your whistle for more then it's time for you to experience it yourself. Tours are available daily, public classes covering a variety of different topics occur every week or two and private classes/events are available.